Home > Web Tutorial > Step 01- How to create a website? Tables are a great way to display data in an organized fashion. Yahoo! SiteBuilder allows you to create tables that contain any number of columns and rows. 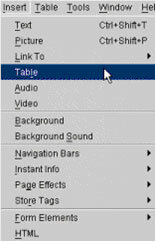 Select Table... from the Insert menu. Use the Create New Table dialog to specify the number of columns and rows, as well as set the cell spacing and border properties. Highlight the text you would like to make into a link. 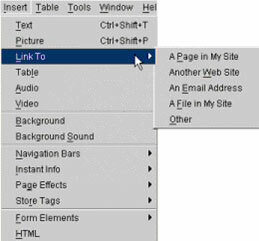 From the Insert menu, select Link To, then A Page in My Site, Another Web Site, An Email Address, A File in My Site, or Other, depending on the type of link you want to create. 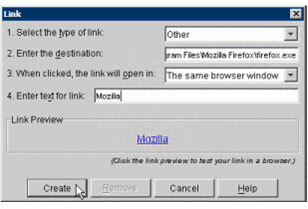 Using the Link dialog, specify the link's destination in line 2, then click Create. 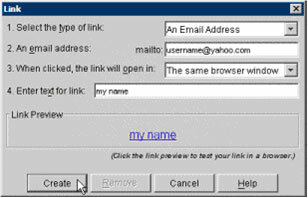 You can also create a text link without first creating text. 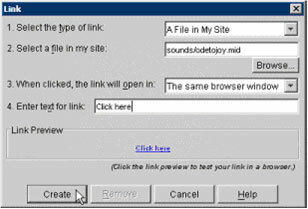 Right-click on the page where you would like to insert your link. Choose Insert from the menu that appears and continue from step 2 above, entering the content you want linked in the Enter text for link: field. 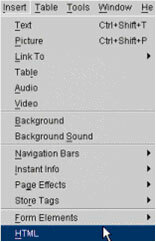 Select HTML... from the Insert menu. 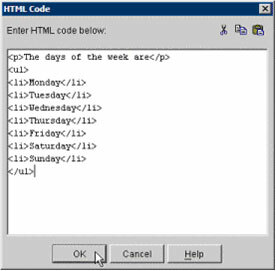 Type or paste your HTML into the HTML Code dialog. If you would like to create a web page using primarily HTML, create a new template page and then follow the steps above to add your HTML code to it. Note: Be sure that the HTML Code element you add to a web page is large enough to accommodate the HTML content it includes. To enlarge an HTML Code element, click on one of its resize handles and drag it to the appropriate size.You may paste HTML code into the HTML Code dialog by clicking inside the empty field and pressing Ctrl+V on your keyboard.